Hopewell – Petersburg, VA. October 1, 2018. 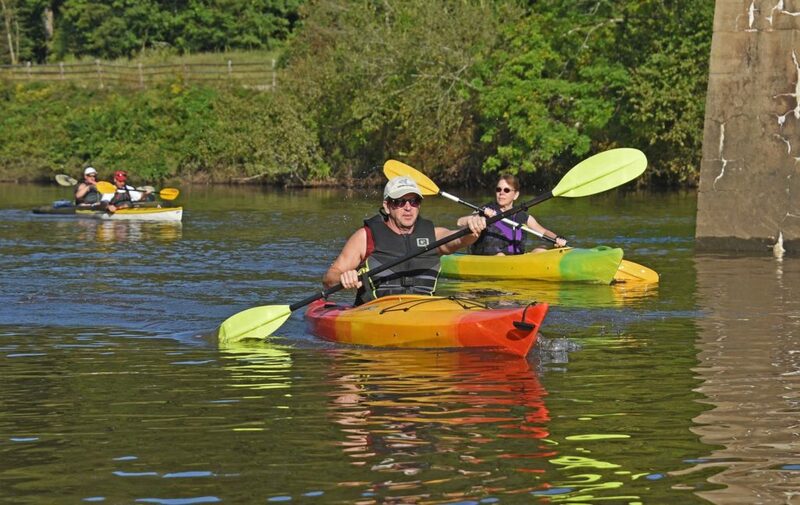 – “It was a blast!” exclaimed one of the scores of paddlers in canoes and kayaks who came out on Saturday to take part in the 10-mile FOLAR Paddle-or-Battle course along the Appomattox River. Participants ranged from novice to advanced paddlers, a boy scout troop to families with pet dogs in tow, to competitive racers – and all enjoyed some of the most beautiful scenery in the region. FOLAR event organizers said that 90 paddlers took off from Pocahontas Island Park in Petersburg with some enjoying the short-course of two miles turning around at Roslyn Landing Park Pier in Colonial Heights. The majority continued to the Hopewell City Marina and were greeted by the enticing aroma of a cookout lunch upon their arrival. Participants said the river was in great shape under beautiful sunny skies, despite the very rainy month and the flood levels reported earlier in the week. At the finish line paddlers shared stories of the day while enjoying music and lunch under tents as vans and trailers shuttled on a schedule to return them (and their canoe or kayak) to their parked vehicle. A 2015 Special Report on Paddlesports from the Outdoor Foundation shows that in 2014, 21.7 million Americans — 7.4 percent of the population — enjoyed paddling. This represents an increase of more than 3 million participants since the study began in 2010. This was the 11th year FOLAR hosted the event that was the brainchild of founding board member, Richard Taylor. The event is made possible through the immensely appreciated help of many volunteers and sponsors, including Virginia American Water and Hopewell Recreation and Parks. All proceeds from the event supports the mission of the Friends of the Lower Appomattox River (FOLAR) to conserve and protect the Appomattox River for all to enjoy. A large number of paddlers and racers were returning participants having enjoyed the event in previous years. Some were already planning their return for next year. One of the returning paddlers, Edwin Arnaldo, achieved the fastest overall time at 1 hour, 41 minutes and received the award for the fastest Male under 50 category. The other award winners were Thomas Williams, fastest in the Male 50+ category; and Sue Scalan, who was fastest in the Female 50+. Congrats to all! “Everybody can get involved,” said Wayne Walton, past chair of the FOLAR Board of Directors and the volunteer who gets up early each year to place the directional buoys along the course. “You don’t have to be a great athlete, and there are many ways to enjoy this water sport,” he said.